Chinese American immigrant women, nonadherent with mammography in the past 12 months, (N = 300) were enrolled in a randomized controlled trial designed to change knowledge and beliefs and increase mammogram use. This report describes intervention effects on changes in knowledge and beliefs between the control and educational groups over four time points (baseline and 3, 6, and 12 months). Variables measured included knowledge, perceived susceptibility, perceived general barriers to mammography, perceived benefits to mammography, and four cultural barriers to mammography (crisis orientation, modesty, use of Eastern medicine, reliance on others). At all three post-intervention time points, women in the education group had significantly higher knowledge scores than those in the control group, regardless of whether they had completed a mammogram during the study. 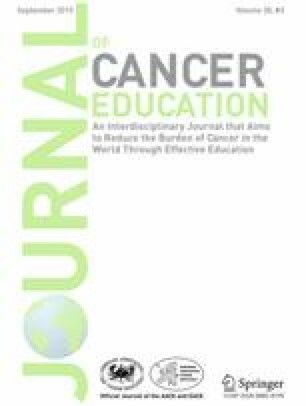 Women in the education group reported higher perceived susceptibility to breast cancer at 3-month post-intervention. At 3- and 6-month post-intervention, regardless of mammogram screening completion, women reported lower concerns about modesty related to mammography when compared to the control group. By the 12-month post-intervention, women in the education group reported significantly fewer perceived barriers than the control group. A targeted breast health program successfully changed breast health knowledge and beliefs that were sustained for up to 6–12 months. Education targeted to women’s knowledge and beliefs has significant potential for decreasing disparity in mammogram use among Chinese American immigrant women. This study was supported by the American Cancer Society (MRSGT-09-090-01-CPPB). We thank the Chinese community and the Asian Health Service Center (AHSC) for their support and participation in this project and also Judith Gedney Baggs, PhD, RN, for the scientific editing. This study was supported by the American Cancer Society (MRSGT-09-090-01-CPPB).